Advice for people with sewage pumps or sewage grinders (Macerators). Sewage pumps have to move solids through the pump as opposed to sewage grinders that cut solids into smaller pieces that can then easily pass through the impeller and discharge pipes. In both cases though there is the potential for the impeller to become clogged as a result of our modern lifestyles and our waster disposal habits. 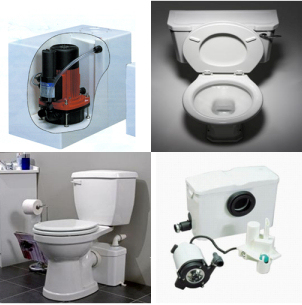 Typically, home-owners will only become aware of problems with their sewage pump when the pump becomes jammed and there is a backup of waste. This is not a problem which is going to go away by itself! Often, the problems causing the pump to stop working are usually because of the items being placed into the sewage grinder. – Paper towels / tissues – these items do not break down easily unlike normal toilet paper. – Plastic bags – incredibly people do flush plastic bags down lavatories! – Cotton wool buds – although small in volume these have been known to clog pump impellers. If you have a grinder / macerator pump the items above can clog the impeller and cause expensive pump damage and can even cause the motor to burnout. A big problem with sewage grinders/ macerators which many people do not think of is dental floss. Most people floss their teeth and then throw the dental floss into the waste basket. However,there are many people who flush used dental floss down the toilet. This dental floss can accumulate in the sewage grinder tank and can eventually become tangled in the grinder mechanism. This can then cause the sewage pump to stop working and potentially a backup to occur.